Dublin will seemingly forever be Ireland's most famous city. As a city with beautiful views and a great reputation, bring part of this great Irish city to your dorm wall decor with the Dublin - Ireland - Panorama. Panoramas for college dorms offer a great way to decorate your dorm room, as they look incredible and bring plenty of color and cool, scenic beauty. Indeed, they're supplies for college that will be your favorite wall decorations for college. * Use Glue Dots to hang the unframed panorama. 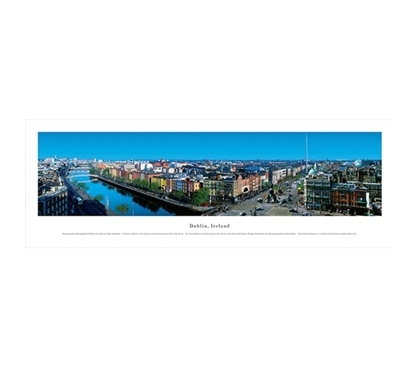 This panoramic photograph of Dublin was taken by James Blakeway. 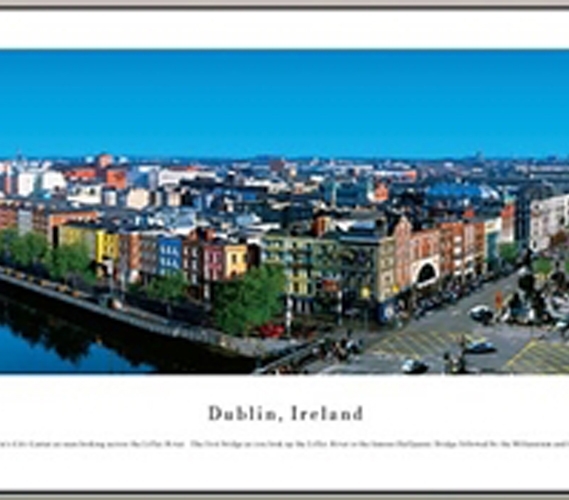 It features Dublin’s City Center as seen looking across the Liffey River. The first bridge as you look up the Liffey River is the famous Halfpenny Bridge followed by the Millennium and Grattan bridges. On the right is O’Connell Street, one of Dublin’s main shopping streets. The building with columns along O’Connell Street is the General Post Office, sight of the bloody 1916 uprising that ultimately led to Ireland’s independence from England. In front of the post office, standing almost 394 feet tall is Dublin Spire, which stands where a memorial to Horatio Nelson once stood.